Spec Miata Community: What Trailer are we using for Spec Miata's ? Author Topic: What Trailer are we using for Spec Miata's ? I have the exact trailer you are looking at and I love it. Its a 3110 featherlite and tows awesome behind my motorhome. Spec miata fits just fine. What ever you buy, make sure you also budget for a brake controller (e.g., http://www.campingworld.com/shopping/item/prodigy-p2-brake-control/50057) - this is a must. Depending upon the total weight of your trailer plus load (Miata) you may also need a Weight Distributing Hitch (e.g., http://www.campingworld.com/shopping/product/eaz-lift...stributing-hitches/7370). I also highly recommend a sway control bar , a simple device and on the highway when a truck passes it is well worth the cost (e.g., http://www.harborfreight.com/trailer-sway-control-kit-96462.html). Post review of my post indicates the Harbor Freight link may not have worked, but you can got to their site and search under sway and it should come up (currently on sale for less than $30). Camping World, as-well-as other trailer part stores often carry them as well. No reason to go crazy with a high end option since it is a simple concept - add friction to the side action of a hitch setup to decrease sway action due to side wind currents (such as a passing truck). I forget it's back there!! For a grand I got a used Carson 18' that needed some love on the electrical. Around here new trailers have been pretty cheap, from just under a couple grand for a light 16' with the biggest discounts for larger, enclosed trailers. We use a winch but a Miata is small enough that a couple of people could push it onto the trailer. Unless you tear a corner or two off it then you'll need to dolly or drag it up. You can usually find 16 ft steel open trailers around here on Craigslist for a thousand or so. They hold their value and are easy to sell when circumstances change. No reason to go crazy with a high end option since it is a simple concept - add friction to the side action of a hitch setup to decrease sway action due to side wind currents (such as a passing truck). This may be true for a small open trailer but I have a 28' TAG with half living quarters in the front and it was downright frightening being passed by a big rig or even a large SUV. I recently upgraded from a Reese WD hitch to the Equal-i-zer. Sway performance is *dramatically* better and it's a lot more like towing a gooseneck. Nice setup. any issues with strapping it down? I'm still undecided on open or enclosed. I'm trying to avoid parking a 20 foot plus enclosed trailer in my driveway. I live in a residential neighborhood and with me, the houses are closer together. I have a long enough driveway so an open trailer would be less conspicuous. I think a big enclosed trailer might ruffle a few feathers. If I go the route of enclosed, I may have a few options for storage not too far from me but at a price. That $$$ option I'm trying to avoid. I use the trailer's factory D tie downs that are recessed in the deck. At the back the straps are very short and when crossed look like they will not keep it in place but they do. I wish I had a more recent photo as I have since put on an aluminum tire rack that hold 8 and the pit bike underneath that. As you can see I do not have a lot of room to park but the 14 foot fits on the grass between the driveway and the house and is not that unsightly for the neighbours. I had to weld on additional D-rings to get the attachment points where I wanted them. X'ing the rear straps makes for some awkward car movements if one of them breaks. Latest update on a trailer. I looked at a 17' 6" open featherlite. Nice trailer and I may purchase if I cannot fine an aluminum enclosed for a reasonable price. There are a lot of enclosed trailers 20 - 24 feet but the GVWR to Curb Weight ratio on some is not that high only like 3500 Load Capacity and the trailers curb weight is close to 4500 lbs without cabinets. I'm also trying to find a trailer with a curb weight of 3600lbs or less (that's with cabinets). I'm looking at the featherlight enclosed and ATC. Both are very nice. George I have a 14' open featherlite that I would sell you unfortunately I'm in Iowa. I tie down going through my pro 2 wheels and have absolutely no problem with length at all and I do not cross. I use to have a 17'6" too much trailer if you want to stay small. George, I just took possession of a 24 ft pace Shadow with 10K axles. It is very big, which will allow for hauling mucho stuffo, plus use it to haul my '61 Chrysler 300 or my dodge viper. It is almost as old as I am (in trailer years), but it seems to be a good trailer: new torsion axles and tires, and a new equal-i-zer hitch in the works. Need an awning, but that can wait. Look for a Pace or another national brand and you can always get repairs made. A 20ft enclosed trailer would be long enough. While the aluminum trailer should be better on maintenance don't expect it to be any lighter than the steel equivalent. I disagree. On the arc website, the aluminum trailer is 500-600 lbs lighter. 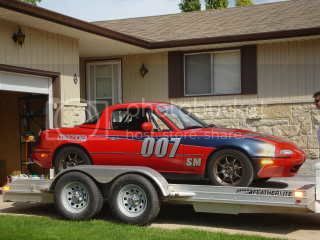 Does anyone happen to have a picture of there miata inside of a 20 or 24 enclosed trailer? I'm curious to see exactly how much room there really is for other stuff. George I am seeing the same thing with trailer weights about 500-600 lbs lighter. Also noticing keep in mind that completly finished interior and cabinets looks to be adding about 300 lbs to curb weight. Looking at cost wise though and trucks performance as I have similiar specs as you, 07 Tundra with the 5.7 tow capacity of about 10,500 I really dont see a need to go aluminum and deal with the assosciated cost. A fully loaded carmate 20' enclosed is about 3500 lbs. Add the car at 2300 your at 5,800 lbs, and factor another 500-700 lbs of other stuff and your up to 6500 lbs total weight which is about 62% of tow capacity. If you go aluminum and save 500 lbs you only drop to 57% of capacity. Doesn't seem like huge savings given the cost. Just my 2 cents. I will try to find some pictures. I tow a 20ft enclosed. It has cabinets and stuff up front. They probably take up about 2 1/2 feet of length if not more. I still have sufficient room for my other stuff. I too tow with a tundra. It does great towing that weight. george, looks like your all over the map on this one. i did this too. the idea begins with an inexpensive and light open trailer, and ends with a heavy box 10' longer than you expected at 3x the price. good times for sure. watch out though...i started hauling my 24' pace with an f150 that is rated to pull 10k. that worked for about 2 months before switching over to an f250 diesel. though the tundras and f150s are rated at 10k, they can't do it very well, imho. it's all well and good when the weather and road conditions are good and flat. but, when all hell breaks loose, the tundra and f150 are probably good for a 7500 lb load, and that's it...and that likely includes your ram. they say 10k, but 10k in the real world could possibly tear your truck up. This trailer is fully loaded, cabinets, lights, tire rack matted floor. But big coin. That doesn't really seem like your saving any weight going aluminum. just extra cost. Have you checked out the carmate trailers? This dealer in PA has a ton and they list all of the curb weights on them and they are pretty close to that 3500lb mark. Good point. I just bought a 2011 ram. I do a lot of local driving, school and kids extracurricular activities and contemplated buying a diesel but didn't want to go that route. You hit the nail on the head,(I'm all over the map). That's why I'm looking for a aluminum and 20 - 22 feet max to keep it around 7500lbs loaded. If that gets too expensive, I'll just pull the plug on a 18 foot open and be done with it. 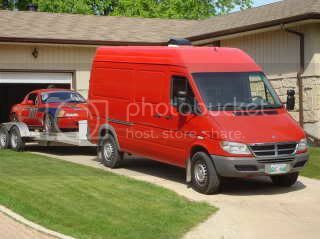 Maybe down the road if I really get into the racing and traveling long distances, I'll trade up to a enclosed trailer. This thing is finished inside. Maybe we should all brainstorm and design a trailer for the spec miata cars. I'm in any one else? Sounds good to me George. That link just went to the main page, but if you look at #6113 it is finished with cabinets and interior and weighs in at 3500 lbs. Slightly lighter than the 22' atc albeit 2' shorter but also 10k cheaper. I know carmate makes a 22' and it could probably be special ordered from them. I can't find #6113. The carmates are nice too. I'm looking at getting into SM next year. I've been doing TT for about four years and want to take another step. I got a 18' v-nose last weekend for $4400 new. It was from a smaller dealer without a ton of overhead. That's a really nice trailer, but the load weight is 3500 lbs. With the car at approx 2300lbs, that give 1200 lbs for generator, tires, jack, gear, tools and spare parts. That's the problem. I want at least a 4400 load capacity. I wonder how much more it would be for 5k axles instead. Can't be that much more. Might be worth a call. That would be the way to go. Then that trailer would be in my driveway. Agreed. I emailed that Hickory trailer for a quote on a cargomate 20-22 with finished interior and cabinets as well. I'll let you know what I find out from them. When I was pricing new trailers from hallmark direct, a stripped 24 with 5k axles was about $5800. Done up with walls, floor, cabinet, lights it was $10800. I'm pretty sure a 20' with 5k axles would be custom. Doubt that would be a big deal. Haulmark has direct listings on newyork.craigslist.org. I noticed that All Pro West also stocks the ATC & Motiv trailers as well. They should be able to order an ATC or Motiv (ATC's steel line) to your specs if you wanted to go that direction. If you like the ATC fit and finish, you can probably get a comparable Motiv built with 5200lb axles. Comparing the Carmate to the ATC/Motiv line is like comparing a Honda to a Lexus. Both are good products, but side to side you'll see a difference in build quality, fit & finished and attention to detail. And they don't cut any corners underneath the skin where you can't see it (that's not to imply that Carmate does). I'm sure All Pro can compare them over the phone. Good luck with your search. Got the 18' open deck. Though it weighs a bit more than an AL one, I tow it with an '05 Expedition (5.4L) and couldn't complain - other than not having a factory option for a front-end tire rack. New it was just a bit under $2k ($1850-something?) and apart from getting the trailer brake controller installed (another $200) it's been smooth sailing for me (2 years now). Let's just say my expedition should probably have some spring helpers when we're fully geared up (wife, dog, clothes, tent, spares, wheels/tires...)! Tomorrow I'm going to find out from ATC what it would cost to order a trailer to my liking. If I can get into one for a fair price, I may order one. Was told that it would take 6-8 weeks. I really don't want to spend too much but I believe you get what you pay for and I don't want to get something I will not be happy with and have regrets. Whats up? We will have to get together for some track time next year. Thanks for the advice. Keep in touch. I'm looking to purchase a trailer for a spec miata. I was thinking about a 14 foot open featherlite. Would this work? Cars are approx 13 feet long. My tow vehicle is a 2011 ram 1500 with a towing capacity of 10,200 lbs so weight isn't an issue. Want a small aluminum (no steel) trailer to keep in driveway and keep cost down to a minimum for a newbie. Gas mileage is a priority. Anyone using one? any advice any for sale? would be very helpful. I'm looking to purchase my first car very soon. Thanks. I will contact you. PM sent. This is bigger than you're looking for but I have an ATC 40' Aluminum 5th wheel for sale. 13K for trailer and hitch. There is a good deal on a 24' Cargo Mate on the Asedan site. That sounds like a nice deal but too big for me. Good looking trailer and very fair price. If I didn't have one already I'd jump on it. This one is always good for a show. All custom, obviously.